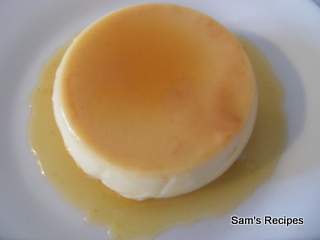 Creme caramel is a pudding best served cold and so can be prepared in advance. I have taken this recipe from the book Cookery School with recipes from Richard Corrigan. The recipe produces 4 individual puddings but I have scaled it down to 2. Also, I have tweaked the recipe to use semi-skimmed milk. Start by making caramel. Place 70 gm sugar in a pan and add 2 tbsp water. Swirl to help the sugar dissolve evenly in water. One absolute rule is that you should not stir the caramel as this causes crystallization. Cook for 4-5 mins till the sugar turns golden brown. Pour the caramel in two ramekins. Swirl a little to coat the sides of the ramekins. Set aside. In the same pan in which caramel was made, add the milk and vanilla essence and the remaining sugar. Allow to warm on a low heat but do not allow to boil. Break the eggs and beat them in a separate bowl. Add a little of the warmed milk to the eggs while beating the eggs continuously. This will bring the temperature of the eggs up to that of the milk without scrambling them. Pour the eggs back into the milk. Sieve the custard to remove any chunky matter. Pour custard into the ramekins. Place the ramekins in a deep roasting pan and pour boiling water upto three-fourth the height of the ramekins. This will allow even cooking of the custard. Bake in a pre-heated oven at 180C for 20 mins. Carefully remove the ramekins and tilt slightly. The custard should be just set. Place the ramekins in the refrigerator for atleast 30 mins to cool. When serving, loosen the creme caramel by passing a knife along the exposed edge. Place a plate upside down on the ramekin and invert it with the plate. The creme caramel should fall cleanly onto the plate.